These nachos are simple and satisfying. The filling can be mixed ahead of time and the actual dish can be layered and baked in small batches so they are warm and crispy for the game day crowd. In a medium bowl, thoroughly mix together all ingredients except cheese and tortilla chips. 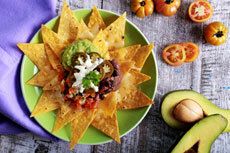 In a large oven-safe baking dish or several glass pie plates, spread a layer of tortilla chips, followed by a layer of the bean and tomato mixture. Sprinkle the two cheeses on top. Bake until warmed through and cheese is nicely melted, about 15 minutes. Tip: Take the leftover filling for lunch along with a veggie salad and shredded cheese. Heat the filling, top the salad with it, and garnish with the cheese. It’s a warming twist so you can enjoy salad while still beating the winter chills.